Happy Presidents Day!! It’s freezing outside! I hate the cold weather and with softball coming up I am hoping the snow will melt in a timely manner. In the mean time, nothing hits the spot quite like soup. 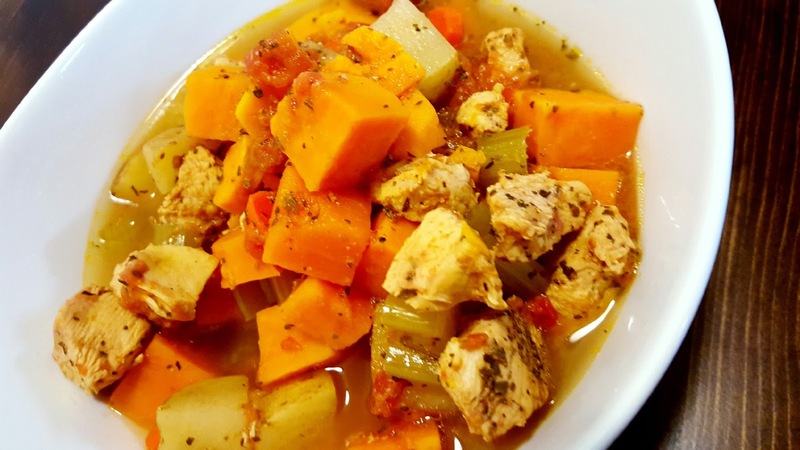 This is a healthy soup that Matt and I made with the ingredients we had in our kitchen! Matt loves to put his own spin on everything, sometimes it’s great, sometimes not! This time was a success! Enjoy! 1. 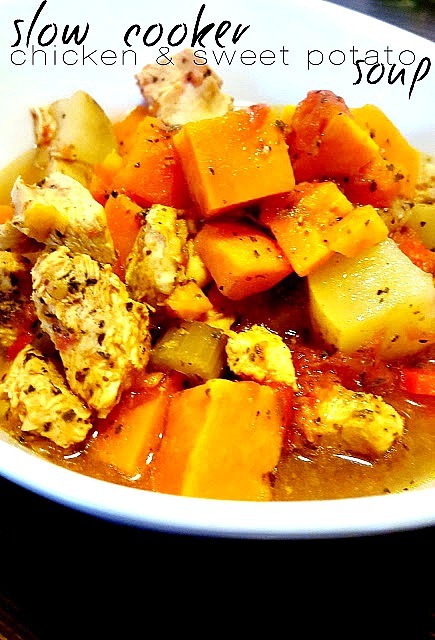 Combine all ingredients in the crock pot. Cover and cook on low 6 to 8 hours or high 3 to 4 hours. You may want to add some extra salt. Then we also added some sour cream. That is really yummy looking! With some nice bread – a wonderful meal! This looks satisfying and delicious! Thanks for sharing at the Thursday Favorite Things blog hop. Your post has been pinned. This looks delicious! I love slow cooker meals! Thanks for sharing this at the #SmallVictoriesSundayLinkup! Wow, this looks so yummy and it goes in the crock pot. What a lovely, healthy, hardy soup. Thank you for sharing your recipe at the Over the Moon Link Party. See you at OTM #11! What a great combination for your soup. Hope you are having a great day and thanks so much for sharing with Full Plate Thursday. What a satisfying soup! 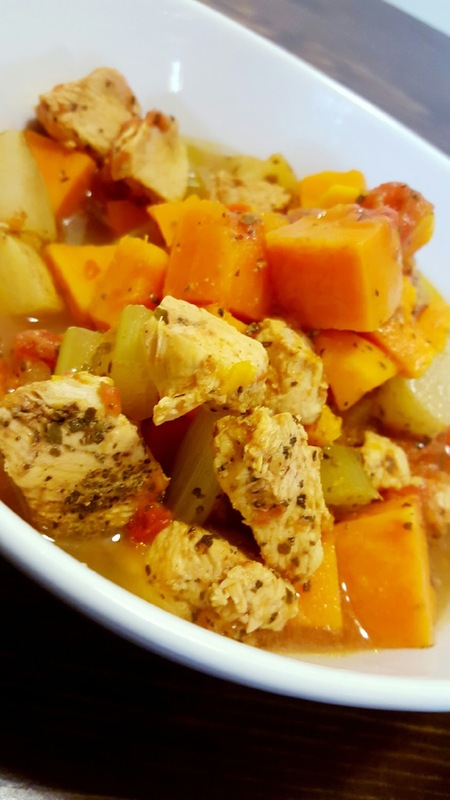 Thank you for sharing your healthy and hearty Slow Cooker Chicken and Sweet Potato Soup at the Healthy Happy Green Natural Party! I'm Pinning and sharing this! My family really love sweet potatoes and I'm always looking for new ways to use them. Shared! Thank you for bringing this recipe to the Hearth and Soul Hop. Hope to see you again this week! Looks like a great slow cooker recipe!! Yum!! Thanks for sharing on My 2 favorite Things on Thursday hope to see you again tomorrow!! Pinned! Thank you so much for partying with us at Merry Monday. Your stew recipe sounds very tasty! I like the addition of sweet potatoes.